Designed by architect Eduardo Posada, the home of Samuel and Dora is a beautiful contemporary style overlooking the shores of La Jolla. With extensive use of a variety of stone and marble materials, sapele was chosen to bring a warm, soft contrast to the interiors. A variety of the mahogany family, sapele is distinguished by its golden brown, almost glowing color, with a distinct ribbon-like grain pattern. The home was an expansive project, with nearly every room of the four level dwelling having varying amounts of millwork. Tight coordination with RGB, the general contractor, was key. Much of the cabinetry is a contemporary “floating” style, designed with highly customized details. Several of the rooms are also clad wall to wall, floor to ceiling in sapele casework and wall paneling. The one material exception is the kitchen, which is done in walnut. The kitchen doors are a custom design, with linear “slats” that match up horizontally around every face. Behind the doors are Blum Intivo polished stainless drawer and pullouts, as well as many convenience hardware items. The kitchen also features a counter-to-ceiling dual-stacked stainless appliance garage system. As the project evolved while in the building stage the design evolved as well. A few key areas were revamped to meet the clients’ requests. We had the opportunity to work closely with the architect in this design process, with the layout of some areas sketched while the owner and architect expressed their ideas. We were then able to quickly translate these ideas into finished product while the rest of the cabinetry was being installed in the home. 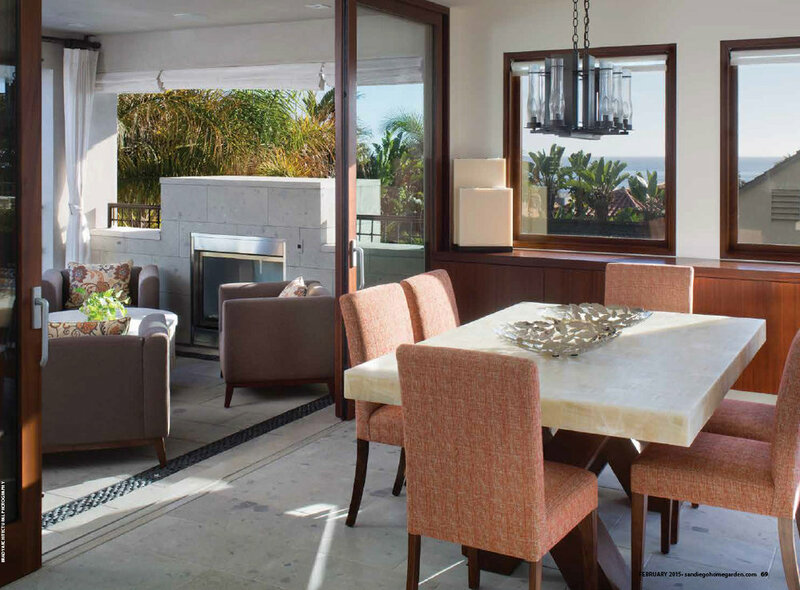 It was an honor for the Trueline Woodworks team to be part of this 2015 San Diego Home and Garden Home of The Year. With every detail meticulously considered and executed, this home is surely one of the finest in San Diego. PATTERNED AFTER an authentic Colonial house in Mexico, the residence that architect Mark Christopher designed for his La Jolla clients was a simple, vertical, adobe-like structure animated by elegant stone ornamentation, a winding staircase and elaborate ironwork. The clients were pleased, the construction permit was in hand and ground was about to be broken when the homeowners decided to move to Costa Rica. Samuel and Dora, the new property owners, weren’t as charmed by Mexican Colonial style. Because their tastes leaned more toward the contemporary, Mark was faced with the challenge of fusing his design with a sleeker appearance. But that wasn’t the only difficulty. Samuel already had his own architectural designer: family friend Eduardo Posada. “I was emotionally engaged with what I had done already,” Mark says. “So I began the commission of restyling this house — bringing together Eduardo’s familiarity of contemporary Mexican architecture with the house that I thought I had already perfected as a Mexican Colonial — with some apprehension. To that end, cantera stone was installed throughout the four-level home on lower exterior walls, the front door’s exterior surround, the pool’s hardscape and in areas of the interior. In several bathrooms, giant slabs of marble were installed on floors and taken to full height on walls. Countertops and sinks were formed from one slab of stone. 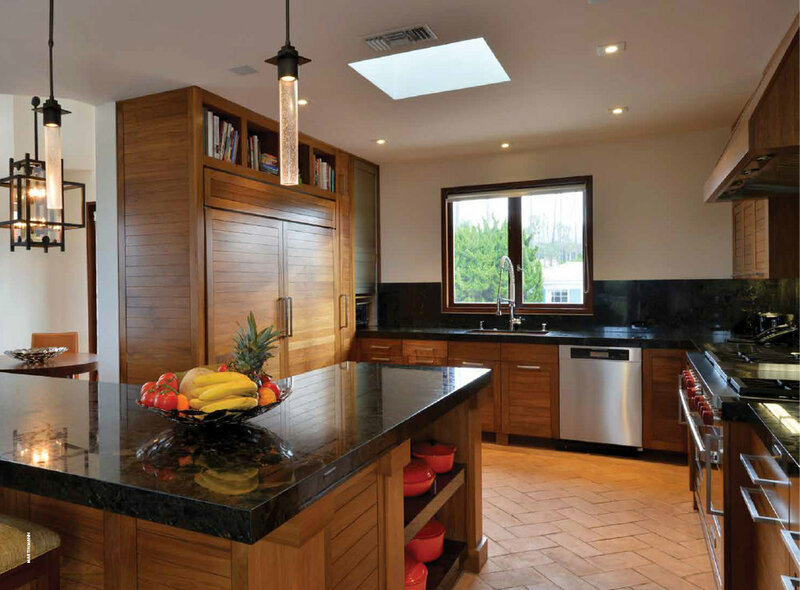 Walnut makes its appearance in kitchen cabinetry, and sapele wood shows up on window and door trims, flooring and at the home’s south end, where Eduardo designed a tower to act as a lattice screen for the stairwell. Delight also is obtained through a sense of discovery. Looking through the glass-paned front door, you get a peek at the ocean and realize that you are about to see something wonderful as you enter. When the front door opens, you walk into the foyer on an intermediate level just below the second story. You have to go up a few steps before you arrive at the ta-dah moment where the full view greets you — a panorama that extends from the dining terrace and formal dining rooms on one side to the family room, kitchen and breakfast nook on the other, through to the patio and the majestic ocean view across from you. Pocket doors link the spaces on the second floor. Even though the rooms for living are placed here and the children’s bedrooms are below, the home cannot technically be termed an “upside-down” house, because the top tier contains the master suite: the crown jewel of the home, with views from every direction and its own balcony. “We created a hierarchy system of priorities based on which rooms would most appreciate the views,” Mark says. The children’s bedrooms, which include walk-in closets, spaces for homework and a wing with an upscale play kitchen for the youngest, are located on the first floor, one flight above the basement. The cellar has an agenda all its own. You can relax in the steam bath, work out in the gym, swim in the lap pool that’s lit from above by a skylight, watch football from five televisions in the game room (which also has a tequila bar and a wine-storage wall) and then relax with a movie in the adjacent home theater. Go back up one level, and you’re on the same floor as the cabana and outdoor pool at the home’s south end. The pool’s original design was adventure oriented: a play pool with a lagoon and waterfall. Water, along with sun, light, textures and colors, are part of the essence of this house. All were brought together to create a lifestyle home that perfectly suits the new owners’ needs.